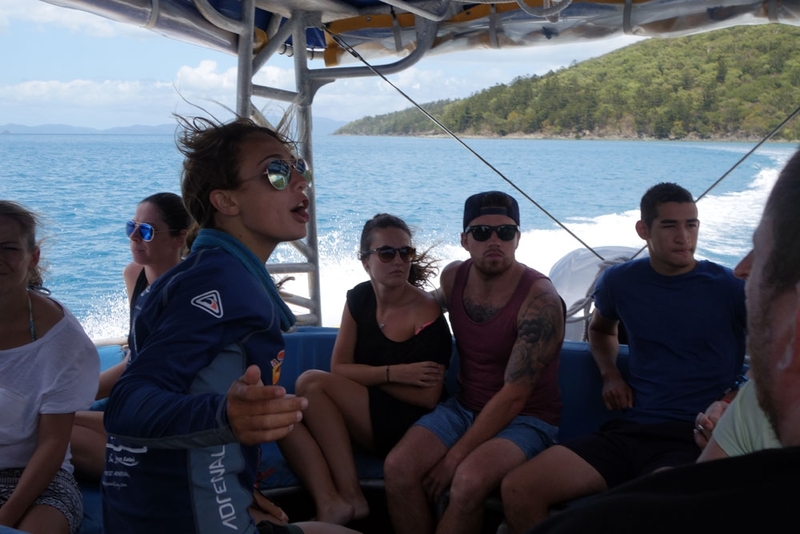 A one day rush of the Whitsundays trying to get as much experience as we could in! I'm realising now that 3 weeks was far too short a time to fully do the east coast of Australia - we had one day to do the Whitsundays so knew we had to make it count and see as much as we could in the time we had. Having seen it now, I know it would be a lovely place to go for a sail if you had time, but sailing boats are too slow for what we needed - we needed something with a bit more speed. These guys aren't a sedate cruise, they are maybe closer to it's antithesis; A fast speedboat pumping music over the roaring engines as you fly between the main highlights of the region. The tour guides were fun and energetic shouting bits of trivia as we went. I think to most people my (TOTALLY RATIONAL) feelings on water border on hydrophobia so I was a bit nervous about the first dive - in retrospect I'm really glad it was the first thing we did or I'd have spent all day thinking about it! 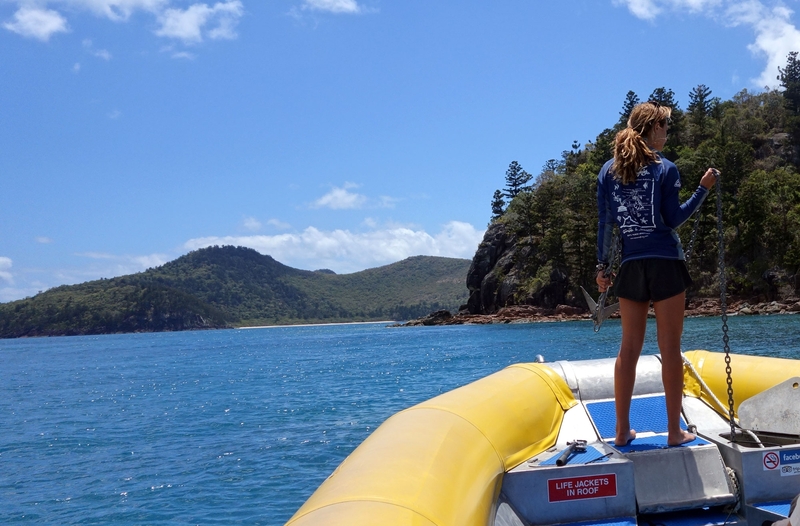 The snorkelling location however was a relatively peaceful bit of fringing reef around Dumbell Island - plenty close to land so I didn't feel like I was about to re-enact Open Water! Stinger suits - or in my case, where they had run out, a wet suit - could be rented for AUD$7 (and are strongly recommended) so once we'd donned our gear and watched the first few people climb down into the water it was our turn to take the semi-proverbial plunge. The part of the reef we explored is a little colourless and dead in places but this being my first snorkel I'm not much of a connoisseur and was more interested in the experience of snorkelling than anything else!. There were plenty of fish darting about and apparently (although our group didn't see one) the occasional turtle. 1 hour was plenty of time to play about in the water - in the end Lisa, in her lighter stinger suit was getting cold so we wouldn't have been able to do much more if we'd wanted to. Clambering out of the water again and onto the boat we took off our suits and got changed to head on to Hill Inlet. After landing at Hill Inlet, we headed up the walk to the lookout over the famous curling sands of Whitehaven. They looked incredible when we were there but having seen the photos in the guide books I think the best time to check them out is at lower tides where more sand is exposed if you can time that correctly. From Hill Inlet we headed to Whitehaven beach for lunch - a feast of a cold buffet with bread, pasta salad, potato salad, rice, cold meat and even mussels. There was food left over at the end so don't fear you'll go hungry! 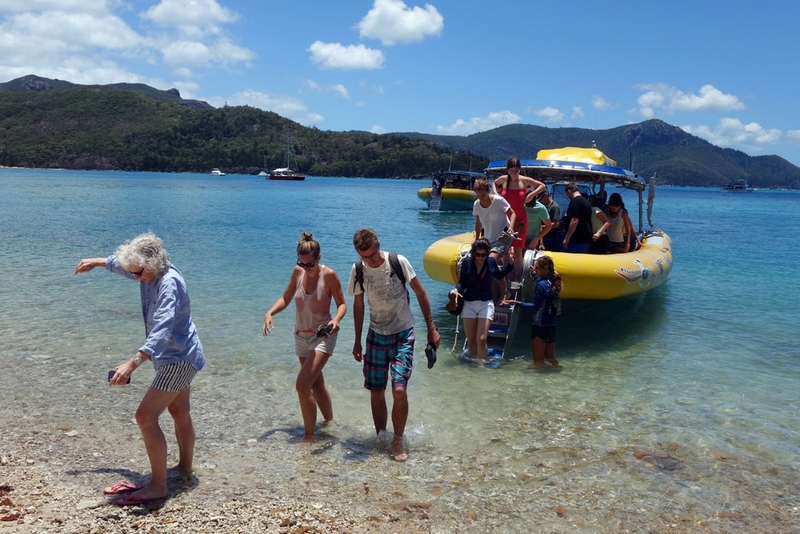 After soaking up the beach scenes for a while it was finally time to jump back on the boat and complete our 120km loop of Whitsunday Island, back to Airie Beach where we got dropped back to the camp site by their friendly shuttle driver. Back section is a little more occluded but still comfy, especially if you get the ones right in front of the engines. 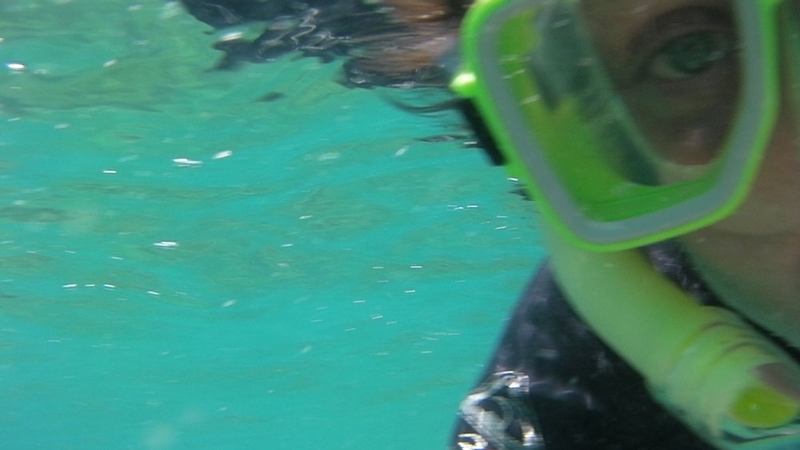 It also gives some great backwards-facing photos which I like. I'd say try all 3 - although I think my favourite was the back seats. Lisa however liked the front set so it's really up to you! The gulls on Whitehaven are a bit evil - guard your food closely and if seagulls start scurrying around you, chase them away or they'll attract others. We'd learnt our lesson in Sydney but a less fortunate member of our group had their food knocked off their plate by one. You'll be out most of the day so sun-screen up - we also appreciated having the Kindles to read when we lay on the beach. In the time we had at Airlie beach where we weren't flying across the blue waters, we went for a 3km one-way walk down the boardwalk from our accommodation, Sea Breeze campsite, west of town. Its a quite nice walk, although a bit long if you are in flip-flops. If you are extra-energetic try out some of the free-to-use council-provided exercise equipment along the way when you aren't oggling some of the apartments along the coast. 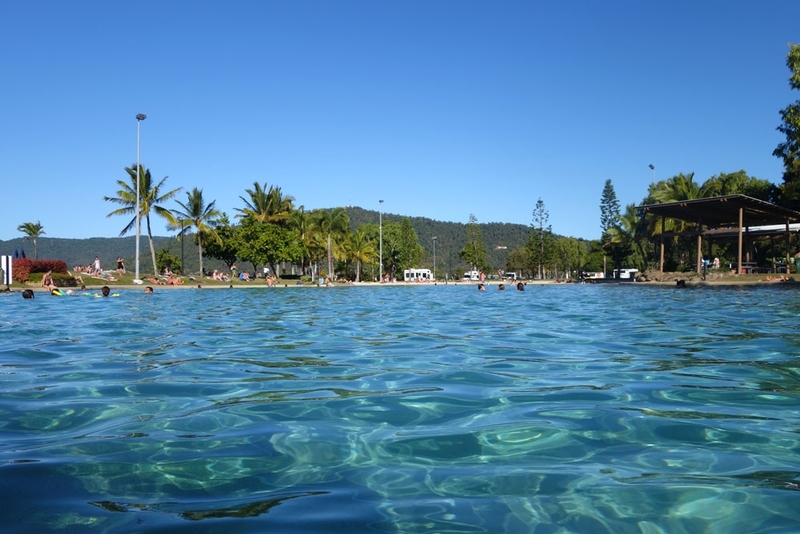 We ended the walk at the Airlie Lagoon, an artificial salt water pool fed from the sea. 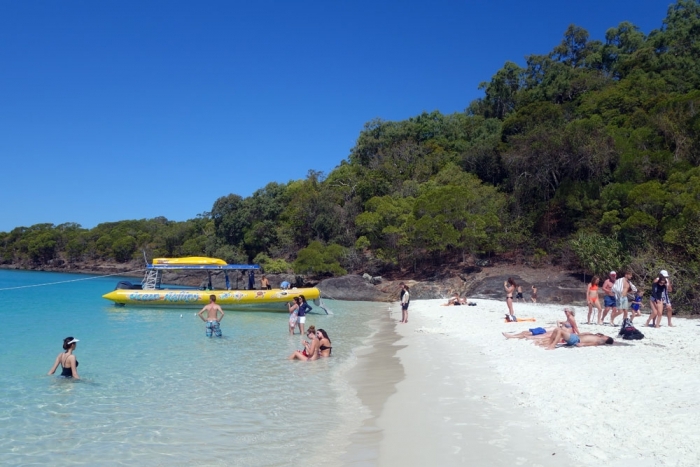 Grab a 'noodle' float and jump in for a quick swim before you head back again!